White water views from this 30 acre residential paradise. 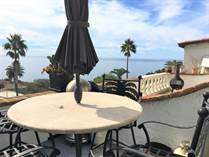 Located continently between Rosarito beach , Bajamar and Ensenada, this respected developer is offering the premier beach front property at affordable prices with financing. This unique location has the only white sandy beach left along the baja norte coastline. Already on site is the 24 hour gated entrance , the lovely club house and fitness club with heated pool, sundeck and steam shower. We will be happy to show you this place under the baja sun.